Final Fantasy IX my first replay that is actually holding up to my nostalgia for it. I definitely had rose colored glasses on for Final Fantasy VII and Final Fantasy VIII, but they immediately came off when I started playing those games. On the other hand, Final Fantasy IX is pretty much just the way I remembered it. It may be my favorite Final Fantasy game out of them all. 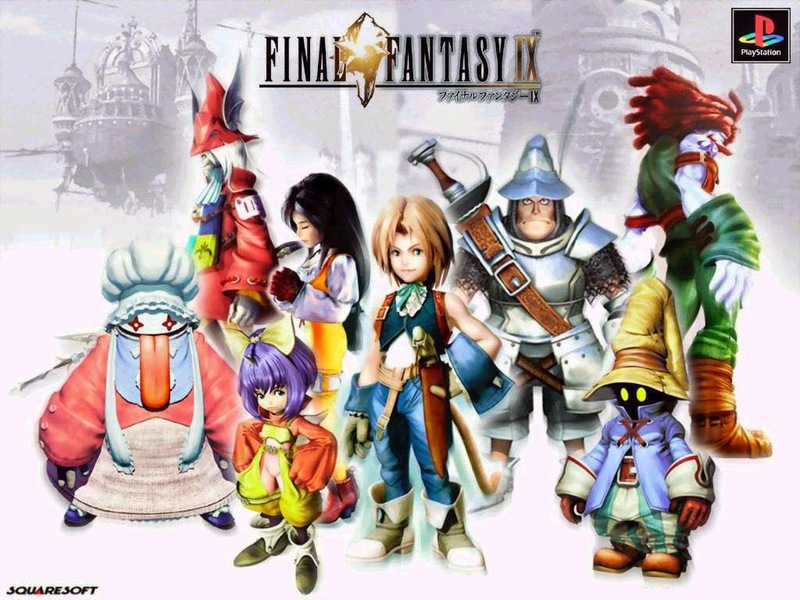 Final Fantasy IX and Final Fantasy X have always been the two at the top of my mind, but playing the whole series is giving me a new perspective. I'm about 3 hours into this game and already it's my favorite out of the nine I've played for my Final Fantasy Project. I'm sure I'll find more flaws in the game as I progress, but I doubt it will get any less than first place when I write my wrap-up for this game. We shall see. Starting the game up I was immediately hit by the stylized design of the world and characters. By this point in the series the creators had figured out the limitations of the original Playstation and designed their game around it. Hence, stylized characters instead of realistic ones. The characters aren't blocks with hooves or smudgy looking realistically proportioned humans like in the last two games. Each character has a unique look and feel to them. They all have a distinct silhouette and body type. It seems like a lot more attention is given to the character animations as well. They show more emotion with the way they move compared to the last couple games. The world is still designed in the same way as the previous two games. There are pre-rendered backgrounds that the characters move on. I don't know if, objectively, they're any better than the last two games. But subjectively, I like them more. I love the world they've created for this game. It's a throwback to all the older Final Fantasy games before Final Fantasy VII and Final Fantasy VIII got into sci-fi territory. Already I've been reminded of one of my favorite aspects of Final Fantasy IX, Active Time Events. They're called ATEs in the game and they're little character vignettes that happen away from the main POV character. This lets supporting characters get a chance to be fleshed out and shine on their own. These ATEs add entirely new perspective to the events happening in the game and I love them. They're a fantastic little break in the action and a chance to get a glimpse of what other characters are up to. I haven't even mentioned the main story yet. It starts off with a bang! A theater troop is flying into one of the largest cities in the world to put on a famous play for the queen and nobles of her country. They're real goal is to kidnap the princess of the country and get away without anyone noticing. In this opening chapter not only do you get to play as the roguish thief (and actor) Zidane but you get a chance to control Steiner while he tries to stop the kidnapping attempt and Vivi while he tries to sneak in to see the play. I love the control of multiple characters, each of whom has their own goals. It adds an interesting depth and sense of perspective to the story. I need more time to experience the music, but I'm enjoying it so far. It's stirring up memories for me of my original playthrough of this game. I think the music in Final Fantasy IX might be my favorite overall score for a Final Fantasy game. Final Fantasy VII through X all have great music, but IX may be my favorite. As I said, I need more time with it to know for sure. My only complaint so far is the battle speed. The ATB gauges seem to crawl across the screen and I spend a lot of timing waiting for my characters to take their turn. Even after I cranked up the battle speed to it's highest setting in the options menu it's still excruciatingly slow. I can see this getting even more frustrating as the game goes on. I'm at about 3 hours of playtime and already having a great time. Expect more soon!